Apart from occasional trips out of the country to collect specimens, Harshberger spent his entire life in the Philadelphia area, including a long-term association with the University of Pennsylvania, first as a student, and then as faculty member. Industrious and with catholic interests, he worked in the areas of mycology, economic botany, phytogeography, phytopathology, conservation, ecology, and floristics. 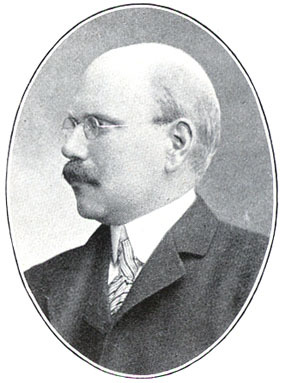 His most important scientific work was probably his Phytogeographic Survey of North America, published in 1911, but his most influential and best known study is his Vegetation of the New Jersey Pine-Barrens, which not only described the area in an educated layperson-accessible fashion, but developed a model of the environment's ecological evolution and brought attention to it in conservation terms. --born in Philadelphia, Pennsylvania, on 1 January 1869. --dies at Philadelphia, Pennsylvania, on 27 April 1929. --Dictionary of American Biography, Vol. 8 (1932). --National Cyclopaedia of American Biography, Vol. 21 (1931). --Ecology, Vol. 11(2) (1930): 443-444. --Bartonia, No. 11 (1929): 51-55. --The Life and Work of John W. Harshberger, Ph.D.: An Autobiography (1928).